Here we go with part 5. 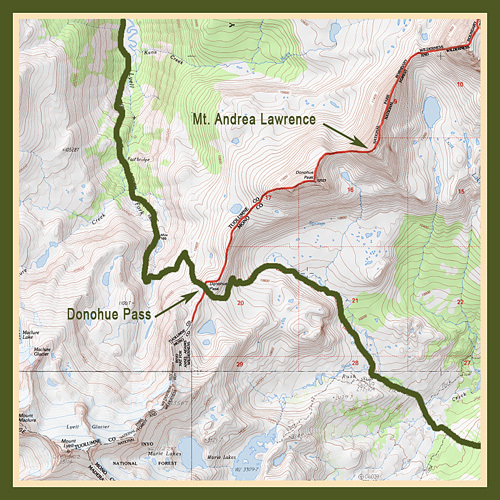 Mount Andrea Lawrence. Named for Andrea Bario Mead Lawrence, a famous Olympian and environmental activist, by President Obama in 2013. Much more on “Andy” Lawrence here. Part of the Rush Creek drainage. Rush Creek. The origin of this name is not known. It first appeared on the Hoffmann and Gardiner map of 1863-1867, and in Josiah Whitney’s Yosemite Book of 1868. It is over twenty-seven miles long and runs all the way to Mono Lake. Waugh Lake & Dam from the JMT. Waugh Lake. 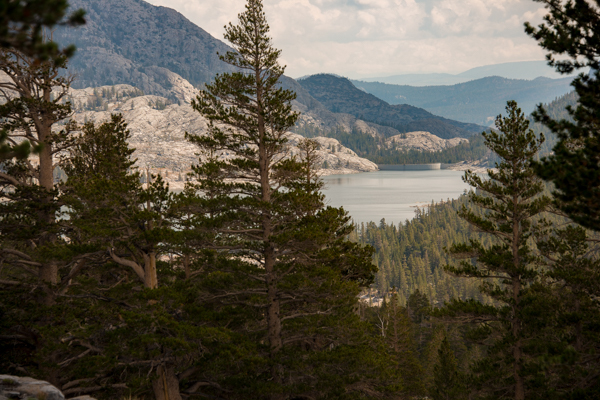 Waugh Lake is visible from the John Muir Trail and was named after E. J. Waugh, the engineer who was in charge of building the dam that created the lake. Rush Creek feeds the lake. In 1977, the dam needed to be repaired, but since it was located within a Wilderness Area the required sand and cement could not be hauled in mechanically (e.g., by helicopter). 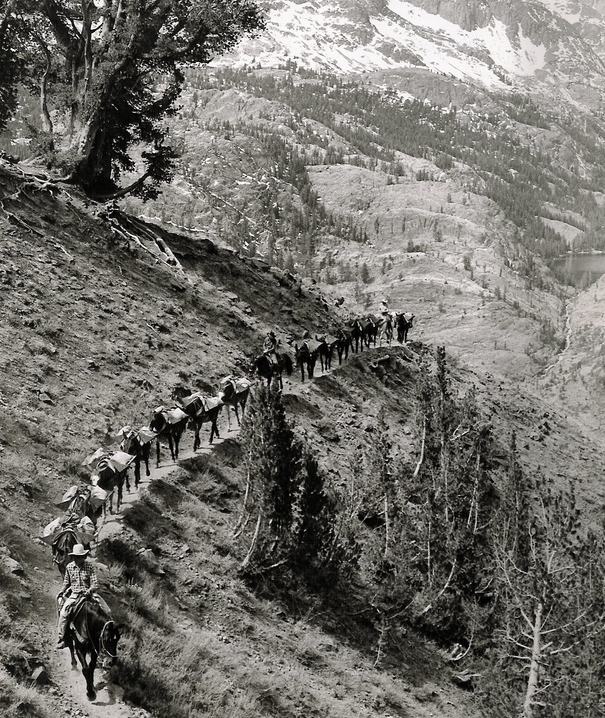 Packers ended up bringing 500 tons of sand and cement in by mules and pack horses (see photo, above). Island Pass. Island Pass is one of two minor passes you will cross on the John Muir Trail; the other one is Cathedral Pass. Either one can be easily missed if you are walking at a good pace, enthralled by the scenery. The eight major passes are far more difficult to miss. The name first appeared in print in the writings of J. N. LeConte, in 1908. The name probably was first used during the 1898–99 survey by the USGS. Thousand Island Lake had already been named by this time, so the “island” in Island Pass may have come from that terrain feature. 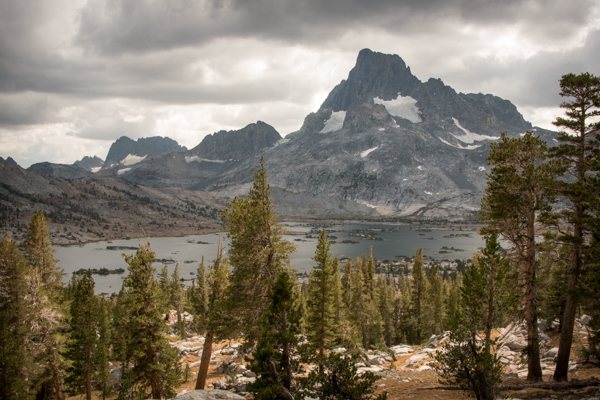 A storm brewing over Thousand Island Lake and Banner Peak. Thousand Island Lake. Thousand Island Lake first appeared on a map in 1896; the lake was probably named by Theodore Solomons. John Muir prefered Islet Lake, but that name did not stick. The view from the bridge crossing the outlet stream (no camping with 1/4 mile of the stream) is arguably the most picturesque on the entire trail. The peak that rises behind it is Banner Peak. More on that next week! These articles are great Ray! Thanks, Larry. I’m learning a lot! Please keep up the good work, Ray. You’re my hero. Appreciate the kind words, Steve. Thanks for the comment. Thanks Ray…I’m greatly enjoying the articles. Thanks for your research and for writing. The background is awesome although it makes me miss the trail! Thank you, David, for the comment and the kind words. Spring is right around the corner and we’ll be back out there.